In 24 hours, I get to see my mom and sister after two years. We see each other and chat once a week over FaceTime (my mom's preferred method of communication) but I don't think that counts. This is also the first time they're visiting us since we moved to California and I've been scrubbing the floors on my hands and knees because I need everything to be "mom-proof" aka "how to avoid feedback on how to life your life, raise your pets, etc.". My mom is actually wonderful and I enjoy spending time with her. I think she likes M more than me at times, which if fine, it might be a Mother-in-law thing. My mom doesn't like to cook, in fact she doesn't understand why I cook with such "heavy" cookware. This is also why I started to cook, early on as a child when my parents worked. It turned out to be the best thing I had ever done! 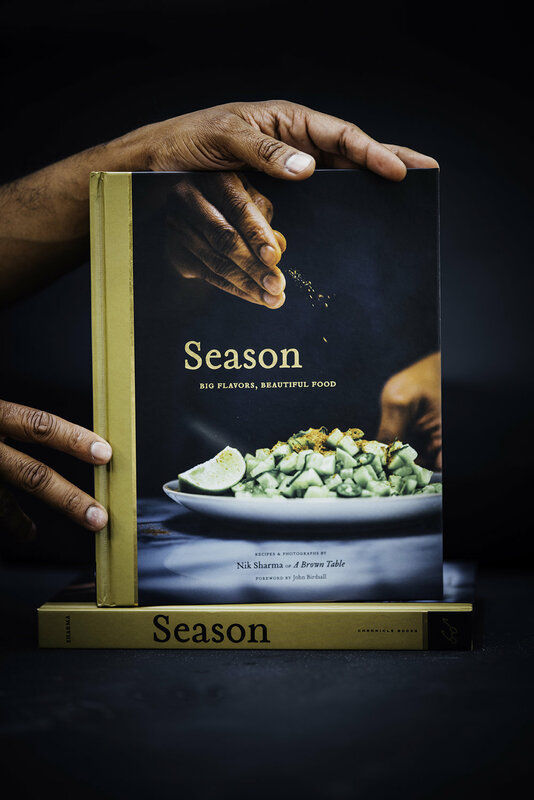 Cooking became my lifeline, my thread that would become my connection to the past, to the present and to the future. This passion fruit tart for example, I had never eaten or tried or even heard of this "tropical-flavored" fruit until I moved to America. It's bright and sunny tart filling that makes me happy every time I sink my teeth into it. Then I add ginger, a root I knew well enough as a savory and sweet ingredient. It can pack a fiery punch into every dessert it's folded in to such as the spicy ginger infused freshly squeezed sugarcane juice sold on the streets of Bombay. 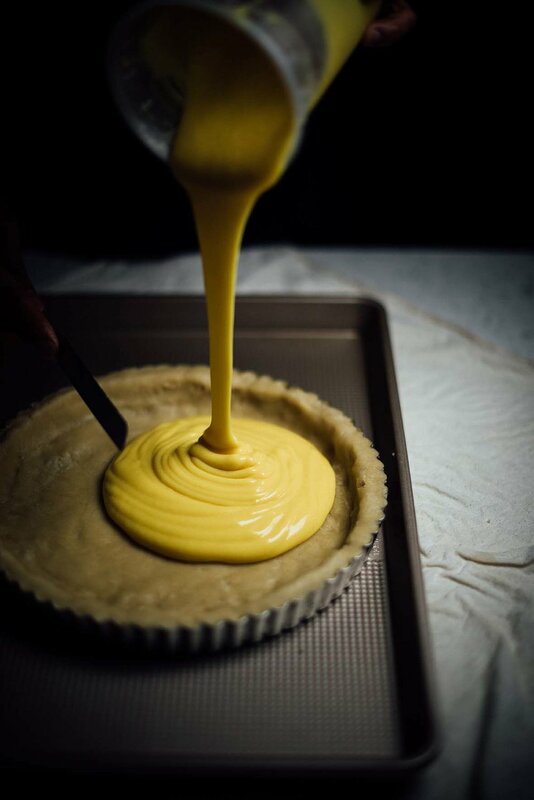 And so this passion fruit and ginger tart like many of the recipes on my blog, ties me to the different moments and events in my life that have shaped my thinking on food. The pretty cake stand was provided by Martha Stewart and I did some urban foraging for my passion fruit (it's thankfully grown on my streets as much as the lemon and orange trees and my kind neighbors usually leave boxes on the sidewalk for people to grab. Use whatever tart shell you'd like to but when blind baking, waterproof the surface using an egg white, it will increase the shelf-life of the tart. Making passion fruit curd is very similar to lemon curd. Be gentle with the eggs while they're cooking and stir constantly to avoid curdling. I don't like to grind the seeds with the pulp in a blender to extract the fruit because it can end up gritty and sometimes the color isn't as bright and smooth as I like it to be. Instead, I put all the pulp in a sieve set over a large measuring cup and stir the pulp aggressively with a spoon to release the liquid trapped inside the soft translucent yellow pulp. The liquid that is released will collect in the cup and I use that to work with. To prepare the ginger juice, peel and grate a 4 to 5 inch piece of ginger root. Squeeze the pulp in a sieve over a small bowl and collect as much liquid as you can. If the starch in the liquid starts to settle at the bottom of the bowl, then stir it well to re-disperse the contents before using it. Prepare a pot of boiling water. Place a large glass bowl over the pot, the level of the boiling water must be an inch below the base of the glass bowl. This allows the steam to heat the eggs evenly. Place the eggs and sugar in the bowl and using a hand whisk or handheld electric whisk, whisk at high speed for about 5 minutes until the eggs become pale yellow and light and fluffy. Whisk in the passion fruit, ginger, and butter. Whisk continuously, until the mixture transforms into a thick custard. Remove from heat and transfer to container. Keep aside until ready to use. The passion fruit curd can be prepared a day ahead in advance and refrigerated until ready to use. To prepare the tart follow the instructions here for this lemon tart (they are exactly the same). You just need to use the passion fruit curd instead of the lemon tart. After the tart is completely set and chilled and ready to be served, take the fruit pulp and sugar and mixing it in a bowl. Place the crème frâiche at the center of the filling in the tart and pour the sweetened fruit pulp on top. Serve chilled. This tart will stay good refrigerated for up to 3 days. Disclaimer: This post was sponsored by Martha Stewart. However, all opinions expressed are solely my own.